From Broadway head west on Coast Highway, the first traffic signal that you get to is Cliff drive. Turn south at the street light at Cliff. The street will immediately veer to the right, find parking as soon as you can! This beach is in a very comercial area. You will often find weddings and other types of parties that are occupying the parking. 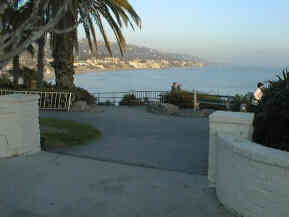 The beach access point is directly behind the Las Brisas resturant. 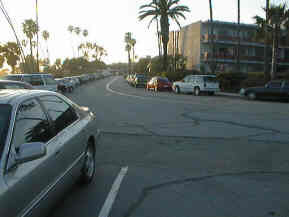 Parking at Main Beach beach is available on both sides of Cliff drive. There are parking meters to feed, $1.00 per hour (bring your quarters) with a four hour limit. Be carefull not to park in someones driveway, you will get ticketed or towed! 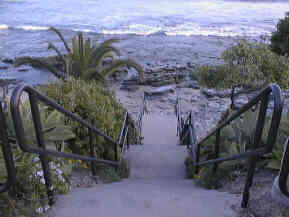 Beach Access at Main Beach is down a paved pathway to a staircase that leads down to the beach area. Take it slow and easy and use the hand rail, especially with dive gear on. Facilities at Main beach are plentiful. There are telephones, bathrooms, and the Heisler / Picnic area is a short walk (to the west) down the path. Pictured is a pay telescope that is available to check out the coast or if you're luck a dolphin or whale pod. You are also right at the center of the city of Laguna Beach with resturants and a variety of other types of shops (numerous art galleries). After your dive come and visit us at Laguna Sea Sports for a quick air fill, then go and enjoy some of what Laguna Beach has to offer. 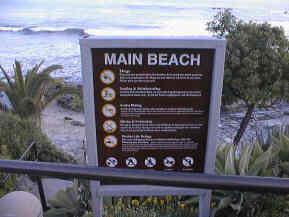 Diving at Main Beach is to the west of the staircase that takes you down to the beach. 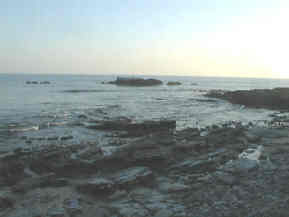 There are several rock reefs straight out and to the west. The entry is very rocky and is easier if you go in on the east side of the reef then head west on the dive. The area is is 10 to 25 feet deep around the rocks. If the there are waves and surge stay away from the rocks it's easy to get thrashed in the shallows. There is a submerged pier off of this beach also.